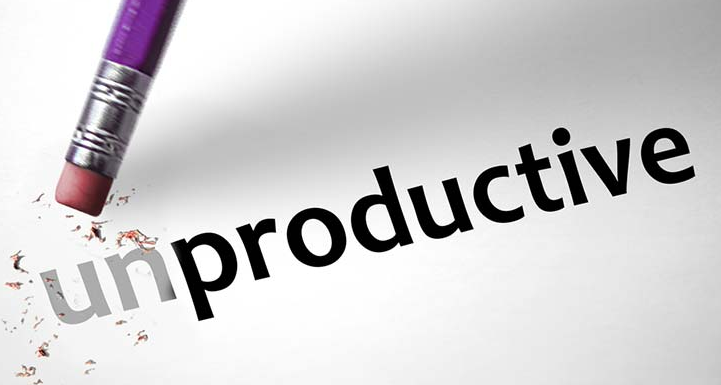 Sciblogs | Productivity growth: how have we been doing? 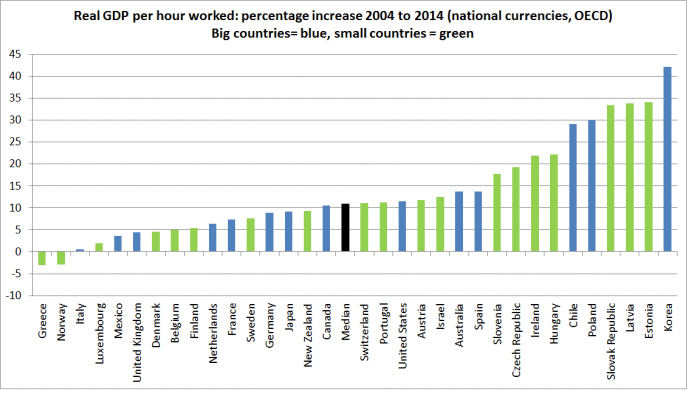 A few weeks ago I ran the chart below chart, showing quarterly real GDP per hour worked for New Zealand for the last decade or so. 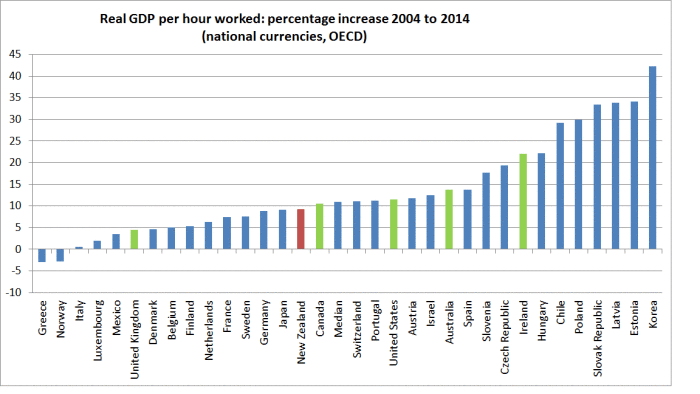 I used an average of production and expenditure GDP, and Household Labour Force Survey (HLFS) hours worked data. The rather dismal picture was of no productivity growth at all for the last few years. I’ve drawn the line no doubt a bit arbitrarily. Netherlands has a population of around 17 million and it and all larger countries are “big”. Other countries, with populations of 11 million or less as small. If anything, the small countries have done slightly better than the large countries over this particular period, but the difference is not enough that I’d want to make anything of it. But the message is still the same: New Zealand hasn’t done particularly well, and plenty of small countries have done better. Over the last decade, we have actually grown very slightly faster than the median of these particular 21 countries. It has been our least bad decade since 1970. But I wouldn’t take much comfort from that: (a) the difference was slight, (b) we grew a bit less rapidly than the whole OECD median, and (c) on our own more recent data (see first chart) we’ve had no productivity growth at all in recent years. It is fascinating data. A couple of things leap out that would benefit from some analysis. One is that almost all of the great performers (more than 15% growth 2004 to 2014) are ex-Soviet bloc countries, which presumably points to the level of the catch-up attained after abandoning highly centralized economic policies in favour of more free-market ones. Of the two that aren’t in this category, Ireland has presumably benefited from both a high level of EU subsidies for their rural sector plus a huge inflow of foreign investment as a result of their very low corporate tax rates, and Korea has ridden a massive tech-sector boom from the likes of massive companies like Samsung and an automobile sector that has taken on the dominant Japanese competitors and won. NZ will never be a Korea, but it could emulate Ireland by lowering its corporate tax rates to encourage greater foreign direct investment. Just in terms of your comments on Ireland and Korea, recall that these data are only for the last 10 years. The biggest gains to Ireland from entering the EU will have been 20 or 30 (even 40) years ago. I am keen on a much lower tax rate on capital income (including business income) and think it would produce gains, altho as the second commenter notes, our distance/location suggests a certain modesty in our expectations of what a much lower capital tax rate might achieve. Well Michael interesting stuff but I put your line of reasoning into my favourite catch all phrase..”If only we were more like ———– then we would be a great country”. 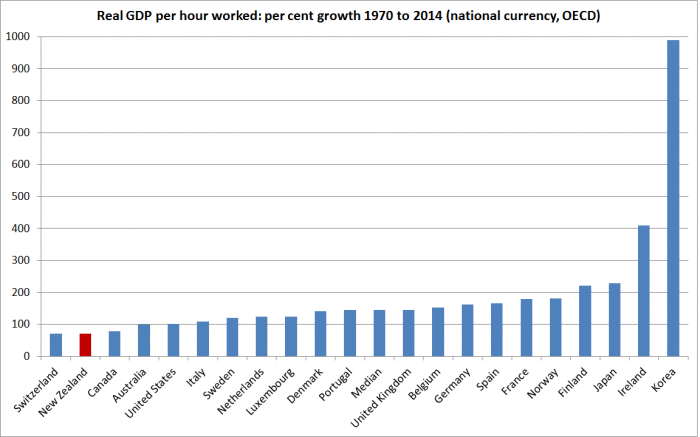 eg If only we were more like Ireland we would have great productivity. Of course we would be stuffed as a country just like Ireland as they achieved absolutely nothing. I work around Wellington and the number of young Irish working here is amazing…I wonder why, because their country is stuffed! I certainly don’t want to be more like Korea either. I have business associations with a major privately owned German company. Last year our annual conference was in Venice and I got the prize for the farthest country and the longest trip time to get to Venice, 40 odd hours. This year it was New Delhi and that was 20 hours. Every year we suggest lets have it in NZ, and predictably we get screamed down with howls of outrage. Also predictably they are setting up operations in Baroda, India. Why, as there are 1.2billion Indians less than 10 hours flight time from Munich. Do you really think a corporate tax rate of 28%, or 24% is going to attract them to invest in NZ with a measly 4.5m people scattered over 4 small cities? I think you have to look deeper, and I think there is no one shot answer. Good Luck with any future analysis but I suspect the answer lies in our history and our culture..what do you think?